Today is my baby girl’s first birthday! It’s hard to believe she’s a whole year old today! 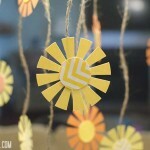 Maybe you’ve heard that we threw her a birthday party last weekend ;-) We did a You Are My Sunshine themed party (check out my Pinterest inspiration board HERE), and it was a great success! If you haven’t already, take a look at the Cupcake Cones that I made for the party. 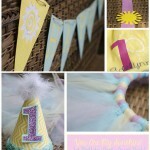 I’m hoping to put all of the party details into one big post sometime next week! Since today is Addy’s actual birthday, I thought I’d share with you the Birthday Board that I made for her. I’d seen them on Pinterest and Etsy lots of places and thought I’d try my hand at creating one for her in Photoshop myself. I am pretty pleased with how it turned out! I used it as part of a photo display table at her party. The onesie was a labor of love. 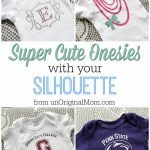 Though they are super-adorable, the personalized birthday onesies on Etsy were just more expensive than I could justify on an outfit that would be worn for a few hours, tops….so I set out to make one myself! Of course, solid-colored onesies are nowhere to be found, so I dyed it myself using RIT dye in my washing machine. It sounded intimidating at first…but it was SO easy! Then I created the design and cut it out of iron-on vinyl (a Pick Your Plum deal from a few weeks ago!) and ironed it onto the onesie. I was pleasantly surprised with how simple it was to complete, and how well it turned out! I also made her a tutu using this tutorial from Paige and Brooke. I needed exactly 6 yards of tulle (2 yards of each color). I cut the fabric in half long-ways, so for each color, I ended up with two 2-yard strips of tulle…then I cut those into 6″ strips and looped them around the elastic. The tutu was probably 4-6″ too long for a baby…but since she was only in it for a few minutes for pictures, I didn’t bother trimming it down. 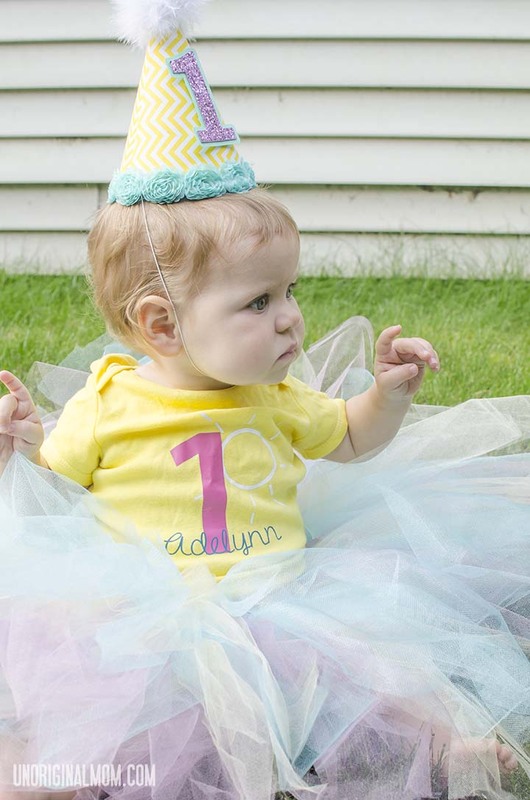 And what birthday outfit is complete without a party hat? I mostly followed Alison’s tutorial over at A Glimpse Inside. 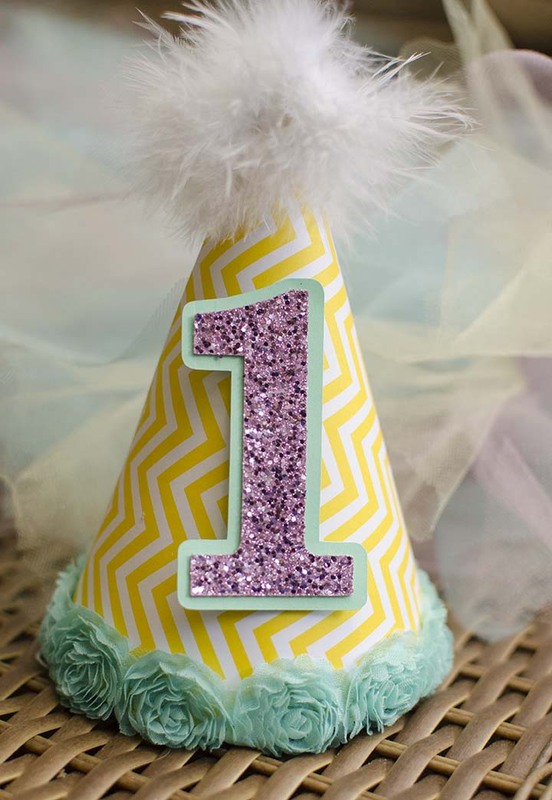 I used spray adhesive to attach the scrapbook paper, cut out the “1” using my Silhouette, and added a piece of a craft boa on top for a little something extra :-) If you’re making a party hat, check the ribbon-by-the-yard section of the fabric store for fun kinds of trim! I love the little turquoise flower trim I found for the bottom of the hat. What a sweetie! I love the outfit you made her and that board is great!! I hope it was a great day! Found you through the link up! 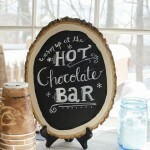 Love, love, love your chalkboard sign!! 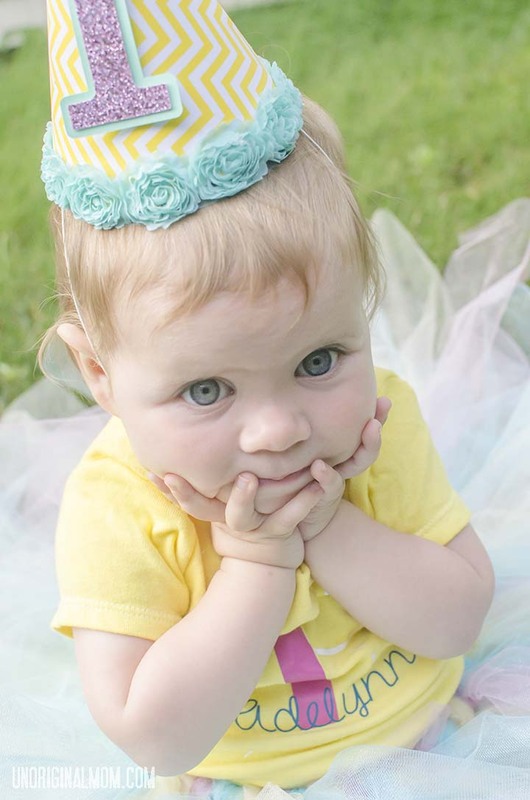 That little party hat is the cutest thing I’ve seen all day – I love the rosettes! 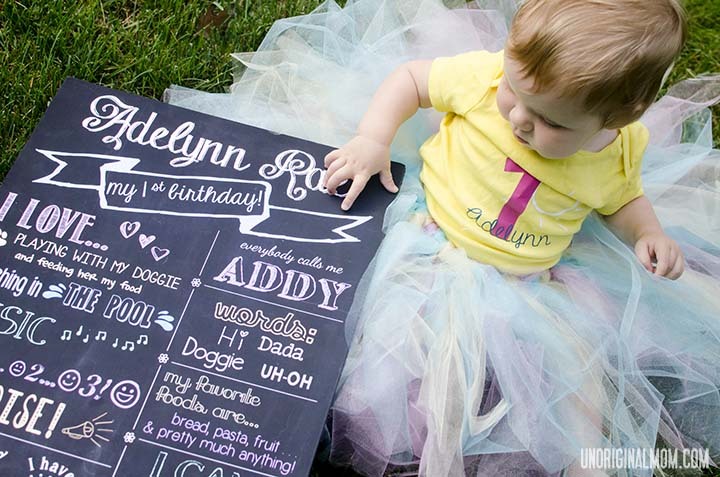 Adelynn is such a pretty name and I think the birthday board you made for her looks so lovely. Simply adorable!I would love for you to share and link up at my weekly TGIF Link Party if you haven’t already this week. Your favorite posts, most popular, recent or new! The party is open every Thursday night and closes Wednesday’s at midnight. Followed by (Not SO) Wordless Wednesday! http://apeekintomyparadise.blogspot.com/. This blogpost is too cute! Love the chalk art! Hi, Samantha! Thanks for visiting :-) I was so happy with how the board turned out…I just had it printed and then used spray adhesive to put it on a foam board, and it looked great even without buying a big frame for it. Now I just have to figure out where I’m going to put it…it will be fun to look back on when she’s older! Happy *almost* Birthday to your little ones! Is that the 20×30 sized foam board from Hobby Lobby? Where did you have it printed? Adorable! I am making my son’s in Photoshop and using yours as a guide! Thanks so much for sharing! 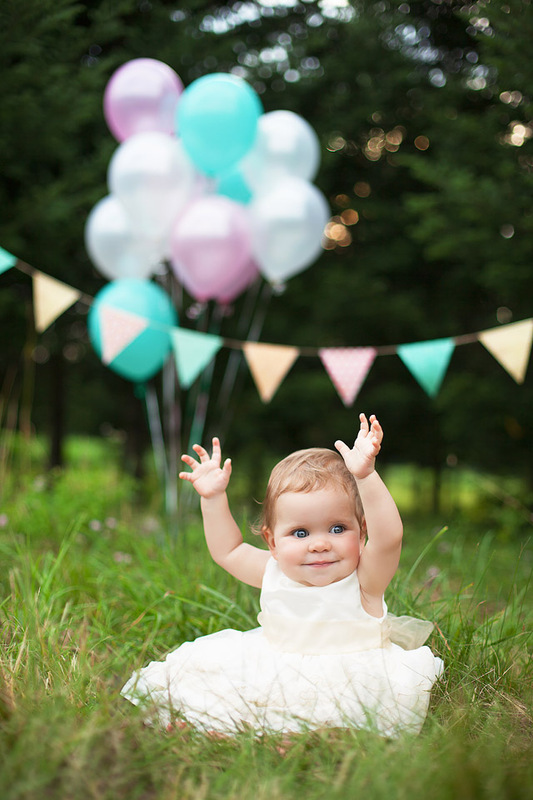 First, happy 1st birthday to your beautiful little girl! 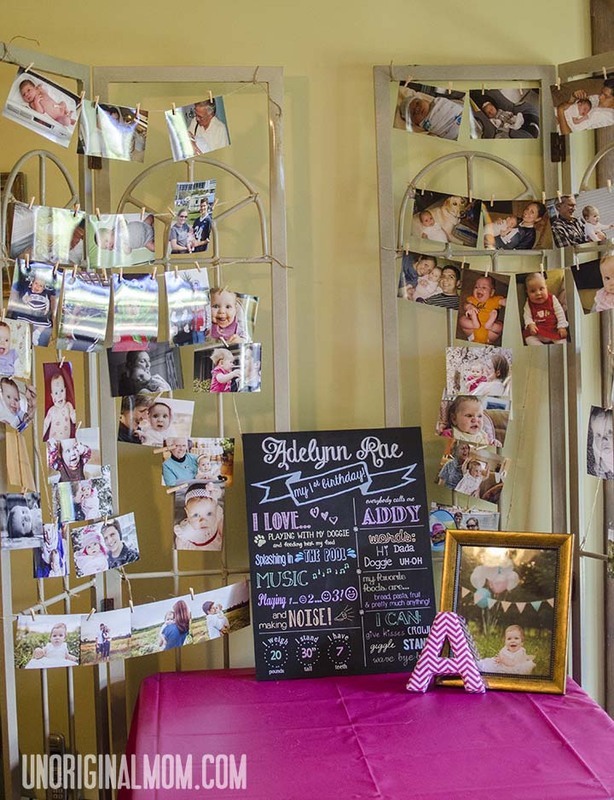 This 1st birthday board is SO creative and neat! It would be so fun to do throughout the years and look back and see how things changed with each birthday! Thanks for sharing! Thanks for sharing your birthday ideas! 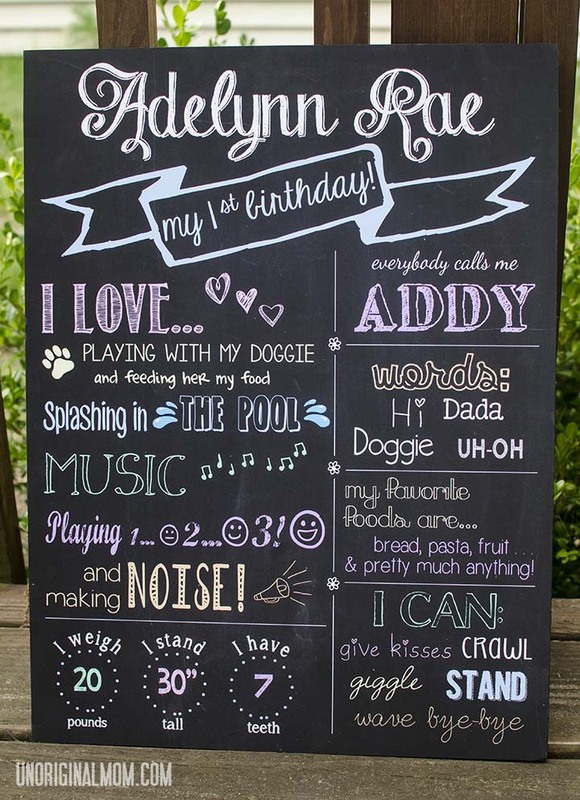 I’m planning my little girl’s first for September and I love that birthday board done in photoshop… so much easier and less messy than real chalk! You birthday board out absolutely DARLING, I LOVE it! We would love to have you share this at our Saturday Link Party. Each link will be shown on two blogs, Made From Pinterest and Bakerette! It starts Fridays at 3pm, hope we see you there! Please remember to put a link back to Made From Pinterest at the bottom of your post(s). LOVE this board! Hoping to recreate it myself…would you be able to share with me the fonts you used? Loved your chalkboard! Where did you get it print? Did you pasted it on a hard board? I really want one like this.